It happens to the best of us, our code throws an unexpected exception. 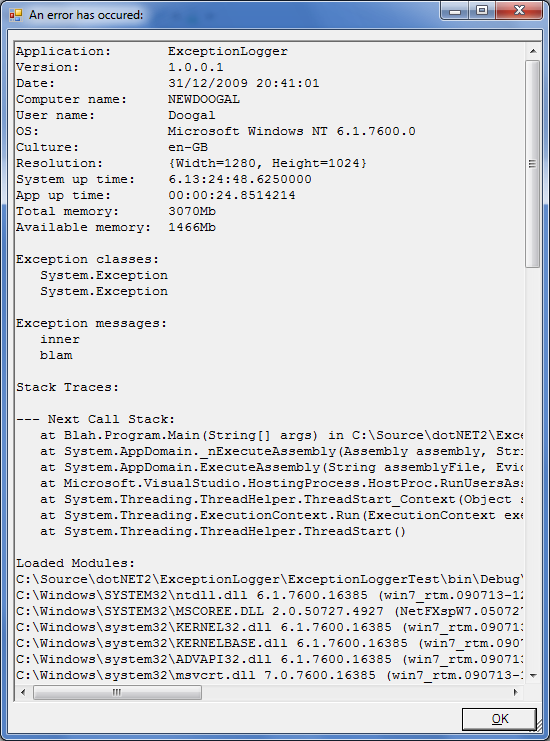 This little class will catch any unhandled exceptions in a WinForms app and log them to a text file, event log or website, along with some useful information such as the call stack and loaded DLLs. When logging to a text file, it also ensures the file doesn't get too big. To use it add the following code to your Windows Forms app, before the call to Application.Run(). The class can also be used in console apps. It will behave differently because although unhandled exceptions will be logged, the exception won't be caught so your application will still crash. One way around this is to add a global try..catch block and call LogException() in the catch block. It may also be used in ASP.NET applications although depending on the trust level your code is running in exceptions may be thrown. You are probably better off with the wonderful Elmah logging library. Finally, this was inspired by the original Delphi version by Madshi, which is much cleverer than my version. Thanks must also go to Nathan Anderson and Oskar Duveborn for the code they have contributed. /// Adds a logger implementation to the list of used loggers. /// Gets or sets the type of the notification shown to the end user.